If there is any rule that governs film festivals, it is that you can’t see everything and you can’t be in two places at the same time. Hence, while I was checking out Tsai Ming-Liang’s Face, my fellow Variety reviewer Richard Kuipers was seeing Australian documentary Stolen. There had been some rumblings that the film was controversial and when I looked at the Sydney Morning Herald the next day, it was plain how true that was. I’d missed one of the most controversial Sydney Film Festival screenings since Dennis O’Rourke presented his doco The Good Woman of Bangkok! What follows is a kind of patchwork of stuff gleamed from the SMH and a few remarks Richard passed on to me (It took us a couple of days to catch up), since he was actually there. I can’t personally pass comment on the film. a) because I haven’t seen it and b) as per usual Variety protocol, the opinion of a reviewer (in this case Richard) remains confidential until the review is published. Directed by Violeta Ayala and Dan Fallshaw, Stolen looks at the plight of Saharawi refugees from Morocco who live in camps in the desert lands of Algeria. In particular the film focusses on 38-year-old Faitim Salami who has lived in the camp since she was 3-years old and works as a teacher. Her husband is a Cuban-trained engineer who works in Madrid. The film’s central premise that Faitim will be reunited with her mother, but in the course of the film the film-makers make an argument that “Arabs” enslave refugee camp residents and take away their children. Salami flew into Sydney (courtesy of the Sahrawi Polisario Front) to say she is not a slave. Her husband also was there and they were accompanied by members of the Australia Western Sahara Association that says the film is seriously misleading. At the George street cinema where Stolen screened there were police outside the cinema, in the lobby and even security guards inside during the screening. The screening started almost 30 minutes late. People were all respectful during the screening, but once the film was over it apparently went up a couple of levels from a lively debate. Booing and cheering punctuated almost every remark, but allegedly neither side could claim that they won the debate. The filmmakers claim that Salami is being given temporary freedom in order to protect the camp organisers. She claims that she has been misrepresented after taking the film-makers into her home. Produced by seasoned Australian documentary maker Tom Zubrycki and funded by Screen Australia, some people believe the documentary is a disgrace, while others claim that it is a brave expose. Ayala claims that despite Salami’s protestations, that she spoke to Salami’s mother and brother on the phone the night before the screening and there was fear about the safety of Salami’s four children in the camp. While Salami and her husband have made statements to the press, they have declined interviews, preferring, understandably, that dealing with the Australian media is left to those who represent the refugees in Australia. Australian scriptwriter, speechwriter and overall sloppy dresser Bob Ellis apparently heckled throughout proceedings. Australian documentary filmmaker David Bradbury who has been in the centre of a few controversies himself over the years, turned up with his camera and was filming the discussion, as were nearly a dozen news crews. The Sydney Film Festival wrapped and the competition winner was Bronson written & directed by Nicholas Winding Refn. The money however goes to producers Rupert Preston and Danny Hansford. No need to get into the creative debate about whether the director or the producer is more entitled to the money here, but word of mouth on this film which features Tom Hardy as notorious British crim Michael Peterson who went by the Charles Bronson monicker, is that it was riveting. 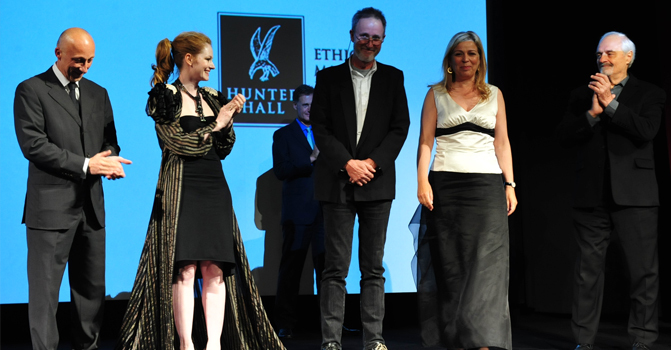 The Australian documentary prize was split between two films. Contact which featured archive footage of the last aborigines to establish contact with the white community and guided those still surviving women of that group back to their traditional land. The other documentary to share the prize (for which Foxtel doubled rather than halved the prize money) was from Mumbai-based director Safina Uberoi for her upbeat though challenging film A Good Man. The film which portrays how an Australian farmer goes into the brothel business to help fund the medical expenses of his quadraplegic wife was a genuine crowd pleaser. So there’s your kick off to the Australian film festival season, which gives both Melbourne and Brisbane festivals a tough act to follow (though Melbourne is off to a good start with Balibo as their opening film). A quick thanks to those who wrote to me with praise and complaints and of course thanks to APSA staffers Maxine Williamson and Jill Robson who just love it everytime I mention them. Finally, thanks to publicist Fiona Maddox from the Lantern group who was indispensable for granting ticket access and generally helping out while doing the work of ten people! The day after Red Cliff played at the State Theatre, John Woo belatedly sat down with festival director Clare Stewart at the Statement Bar. While Woo claimed that he is a shy man and that he preferred expressing himself in visuals rather than language, it didn’t stop him from talking garrulously about his career. Slipping between English and Cantonese (with a very capable interpreter helping out for us gweilos in the audience), Woo spoke about his early influences, including how he credited his guardians at a seminary for steering him towards artistic rather than religious pursuits. Learning to make movies by watching movies (Melville and Peckinpah were the first names off his tongue), reading library books (and frequently not returning them) Woo also stressed that he learned about movies by “reading critics as well” (Take that Bill Bennett!). While Sydney audiences were deprived of the 5 hour version of Red Cliff parts 1 & 2 (which the director clearly preferred to the truncated and united version), Woo seemed perfectly willing to go over his career in great detail and gone on for double the two films running time and enjoying the remenisces just as much as the eager audience hanging on his every word. Regrettably for all, Woo had a further media commitment but even as he acknowledged the need to move on he kept talking. As the session was winding up, he took a question from a young audience member which has all the hallmarks of rambling danger. First the young man identified Woo as a personal hero and then identified himself as an aspiring film-maker… I was starting to feel anxious as I’ve heard a number of self-aggrandizing raves start from this juncture at many Q&As over the years, but I need not have worried, when the young man finally got his question out about Woo reconciling his religious beliefs with the action and often bloody content of his films. The depth of Woo’s answer clearly indicated that the young man had struck gold, as the action director outlined how he keeps his Christianity in the church and his film-making on the movie set. Whatever the following media engagement was, I bet the journo didn’t ask or get anything so considered. The Gold Coast came to Sydney tonight with APSA hosting a pre-screening function for Khoa Do’s latest film Missing Water. At the Sydney Hilton’s Zeta Bar, cast and crew of the low-budget film were in attendence, as were several of APSA’s Sydney supporters and newcomers to the fold, as well as core APSA staff like Maxine Williamson, Jill Robson and Richard Watson. Chairman Des Power spoke about how Do’s work was part of APSA’s original pitch to UNESCO and how far the awards have come since their instigation in 2007, citing the way that posters for the fabulous Kazakh film Tulpan carry the APSA Best Film 2008 print alongside festivals like Montreal, Tokyo and Cannes. Do followed Des’s speech by speaking about his excitement about being included in the Sydney Film Festival’s competition and the honour of telling a story that so strongly represents the experience of his family and community. The film played to a rousing reception in the State Theatre which was well populated by Do’s supporters and prominent members of Sydney’s Vietnamese community. I believe there was also an after party but I had to go home and write my review. Despite being under the gun with reviews, blogs and squeezing in the viewing of the occasional film, I did find time to write a letter to The Sydney Morning Herald. In today’s paper (or on-line where I read it) former journalist and film-maker Bill Bennett (Kiss Or Kill, Spider and Rose) wrote a rant about how Australian critics hate films, how he’d never been to a film festival (except when he was screening his own film, which for some reason didn’t count) and how he’d never seen Citizen Kane. As The Sydney Morning Herald is a sponsor of the Sydney Film Festival (industry sycophants at IF magazine: take careful note of the festival’s name. Your slide is incorrect) I suspect that the article was a pre-arranged PR stunt to spark controversy. If so, the stunt worked. Not being one to let a wrong go uncorrected, I rose to the bait and my heavily edited reply also appears on the smh.com.au website in the incredibly difficult to find letters section. I suggest the Festival reserve a place for Bennett on next year’s festival jury so he can have his horizons expanded, or at least offer him a DVD of Orson Welles’ debut. A mere 24 hours after I write about the high standard of this year’s Sydney Film festival programme, I hit a dud day. It can happen anywhere but one feels like a goose after my proclamation. Fortunately, despite one dull Oz doc and one strained Oz feature, the day did have one shining delight. Old Partner, a touching and frequently amusing documentary from South Korea was purely captivating. I have to admit that my prejudices had prepared myself for boredom, but this film about an aging farmer, his prized ox and sometimes justifiably jealous wife turned out to be a must see. I haven’t checked yet when it was made or released (and therefore whether it is eligible for APSA consideration), but didn’t want the film to go by unheralded. I was standing out the front of the State Theatre with Sydney Film Festival President Virginia Gordon as we both watched the audience slowly file in to see Steve Jacobs new film Disgrace (which is just as fabulous as has been widely reported by the way. It beats me why Icon have sat on this fine film for so long). We chatted about a few topics including ticketing (every festivals nightmare), and the tendency of Sydney audiences to abuse politicians who visit the festival. Virginia also clarified that the truncation of the festival was not a response to the Global Economic Meltdown, but a directive given to artistic director Clare Stewart because the Board felt that the festival was becoming unwieldy. Given that the normally 16 day festival has been haemorrhaging money (as festivals do) since the mid-90s when then Sydney Film Festival director Paul Byrnes was competing with Tait Bradys better funded, better programmed and even longer Melbourne International Film Festival (which is also shorter this year), one wonders what has taken the Sydney Board so long to react. Anyone with a basic sense of economics has been saying for over a decade that the Sydney festival should only be about 10 days long as per the duration of most festivals around the world. 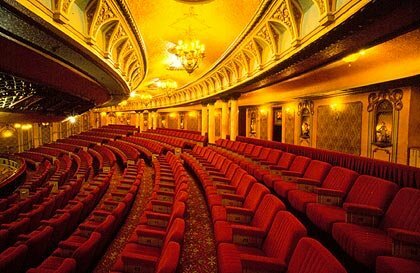 The fabulous State Theatre is also a prohibitively expensive venue despite its beauty. (Paul Byrnes once publicly referred to it as “jewel in the crown and the pain in the arse”) Regardless of whether it is a Board directive or a response to the world financial crisis, the fact remains that Clare is the best Sydney programmer since David Stratton was in charge (though her Asian programming is rather slight). Consequently, there have been less duds in the programming, audiences generally seem more satisfied (though they are quibbling about the online ticketing), and the competition now offers a sense of momentum that was lacking when it debuted last year. Heres hoping that the festival remains around this length. Now all the Board have to do is take care of that other detail that the Sydney Film Festival has been oscillating over for years: moving the Sydney Film Festival to a more suitable date for international attention. My money is on November. A rumour is circulating that the date change will be announced at the end of the festival, but I think they will wait until the next AGM. For the past couple of years if anyone in the Australian film industry uttered the words “40 per cent” they could only be talking about the maximum offset that can be received by foreign investors. This funding concept has been touted as the primary reason that 2008 is proving for a bumper year for Australian film with about twice the normal amount of locally produced movies being released. The Sydney Film Festival have instigated an industry day this year and the first panel I attended was on this very topic. (There was a yum cha session in the morning, but I just can’t face dim sum at 8.30am). Sharing their experience was Jack Arbuthnott of BBC Films, Marian MacGowan who co-produced the Australian/UK co-production Death Defying Acts, Rosemary Blight who is in pre-production on a partially French financed film called The Tree and Finola Dwyer whose film An Education is closing the Sydney festival and who did an Australia, New Zealand, UK co-production with Dean Spanley. An informative session, its anglo bias was nevertheless betrayed when Sally Browning, Investment Manager with government body Screen Australia on her intro neglected to mention the two Asian countries who are approved options for official co-productions and therefore eligible for the tax offset. (China and Singapore just in case you don’t know). The audience of about 70 industry producers and listened with baited breath for tips and also heard the problems that can beset even successful co-productions. In a separate session Jan Chapman spoke about her UK co-production on the new Jane Campion film Bright Star (with a pained smile, Chapman emphasised that if nothing else the experience had taught her “how to share”). Fascinating though this was, it brought back memories of my attendence at the Hong Kong Filmart where Asian producers were asking me why there were no (ok, a couple) Australian producers at the Hong Kong market. Even the Australian film Mao’s Last Dancer shot in China was not an official co-production, but was done “on the fly”. Perhaps next year at Filmart (or even this year at Pusan or Tokyo), Screen Australia could show some initiative and set up a booth at one of the three major Asian markets to help facilitate meetings with Chinese or Singaporean producers and creatives. Until success is established through Australian affiliation with these countries it is likely that other Asian companies will have an opportunity to follow suit. Those seminar attendees who slipped away after lunch (delicious cannelloni and some chocolate cakes that were to die for) missed a rare peek into the world of sales and marketing presented by Vice President of Fox Searchlight Europe, Christophe Mercier. It was to be a shared session with Liz Watts (Little Fish) and industry stalwart Sue Murray, but Mercier dominated, entertained and enthralled with a detailed presentation, which revealed how films like Little Miss Sunshine and The Last King of Scotland are packaged for different markets and how film festivals like Locarno are used to make a springboard into the local markets. I’m so glad I caught it. Weirdly enough I almost missed it. During lunch I got a call from one of the festival’s publicists to say that she was sorry she hadn’t returned my earlier call, but no media were permitted at the Industry day. A cheerful about face occurred when I told her I was already there. Beside myself there were two other journalists (did everyone else really take “no” for an answer?). While there were no security checks to the Sydney Hilton meeting room where the seminar was held, I had arranged access via the New South Wales Film and TV Office the day before. When I mentioned the proposed media blackout to some of the producers present, they were astounded, “It’s not like we are giving away trade secrets!” said one. Nevertheless the sessions were terrifically valuable and I think would have received good coverage for the festival if they had encouraged media to attend. With all the extra-curricular activities going on it’s been hard to accommodate the main reason for going to a film festival, ie. watching films. Amongst the few films I have seen so far I finally got a chance to see Breathless which was one of the main buzz events at Pusan last year. Great performances buoyed me through an over-extended running time and certainly made the frequent violence and the excessive profanity (which also provided some hilarious moments) easier to watch. I’ll watch more films over the weekend, I promise.